Connected products are far from 100% unreliable. With customers across commercial and consumer markets, DevicePilot has unique typical performance levels and the underlying reasons and mitigation. If you're like most connected product companies today, you'll struggle to achieve "one nine" of uptime (working 90% of the time). This is a much worse experience than for typical unconnected products. To move towards two nines (99% uptime), you must reduce your downtime by a factor of 10. Why are IoT sensors unreliable (and how do you fix that)? ○ Add some redundancy in the data you sent. Repeat any important "state" information regularly even if it hasn't changed. Design your application to cope with missing data. For example, asking the average temperature of a million sensors when only 100 are missing isn't an "error", it's a reasonable answer, albeit with a caveat. Ultimately, your application may sometimes have to say "I don't know" because the input data is too patchy or too old to allow a high-confidence answer. 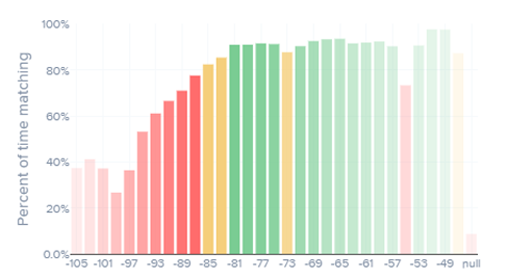 DevicePilot's Cohort Analysis page is a good example of these principles in action: the colour-density of each bar on the chart shows the number of devices making up that sample, making statistical significance intuitive. Be aware of some "laws of physics" limitations. For example, if your device is using cellular connectivity, is deployed indoors, and you have no control over its exact placement, then you will be lucky to achieve 92% network availability. If you're deploying a lot of connected products, you can't ignore the challenge of reliability. DevicePilot provides a great way to get the big picture to identify, measure, analyze and resolve you smart product challenges.